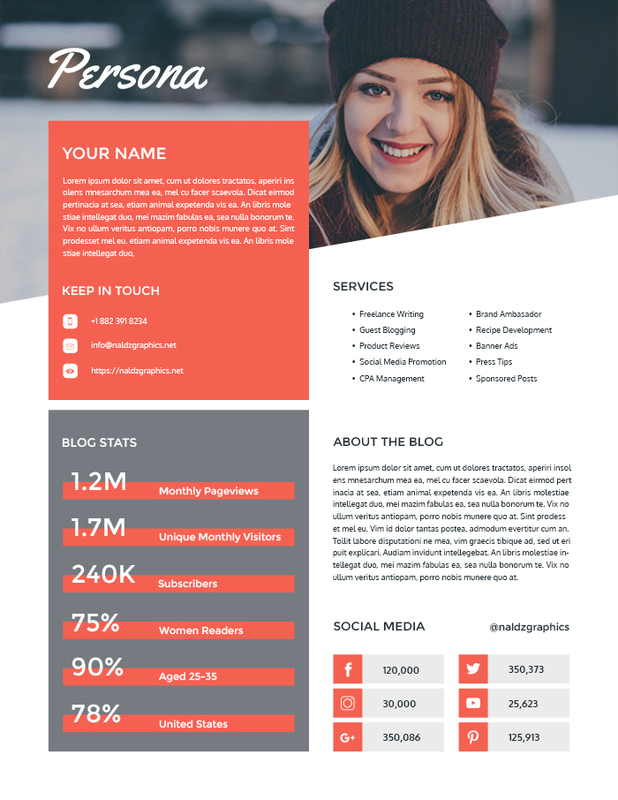 I recently made my wife a media kit for her travel blog. To be honest, It is my first time designing a media kit (mostly I do business card and brochure design). It’s like a Portfolio that you can show to your readers or clients but more summarized. With that in mind, I think there are also people like her that would want or are looking for something like this that they can use on their blog. Hence, I’ve decided to make some media kit designs and distribute it here for FREE. These 3 single page media kits were made in Photoshop CC 2017 and are compatible with versions that has Smart Objects available. With a resolution of 8.5×11 inches at 300 ppi, it will still look good if you want to print it out. All layers can be customized, so feel free to experiment colors and fonts until it meets your expectation. For those who will download the files, make sure you have a Photoshop installed in your unit. Without further a do, here are 3 exclusive media kits to download and are ready to be yours. 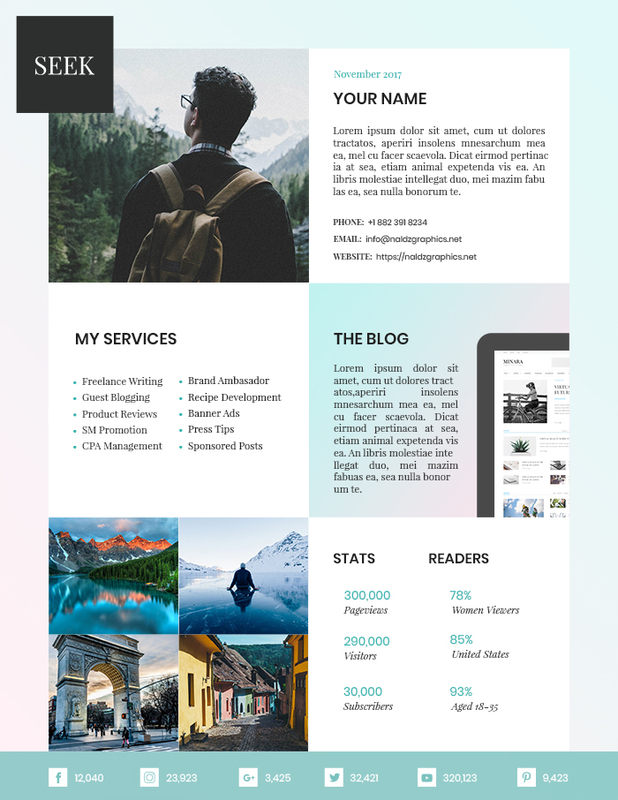 Persona media kit is for users who wants to show off their services clearly and with bigger personal photo of themselves. This can be used in any kind of niche like travel, marketing, consulting and more. For the fonts, I used Montserrat and Oxygen combo. If you don’t have these fonts yet, you can download them on google fonts. Main color is #f46151. 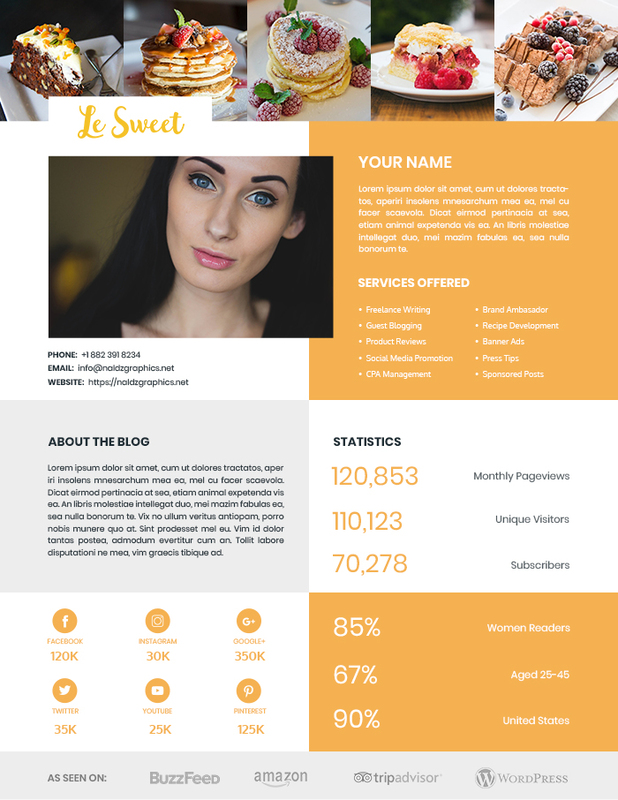 This media kit is for personal bloggers who loves cooking or under the food and cooking niche. You can add up to 5 of the best photos of your recipes by simply double clicking the Smart Objects Photos on the file and dragging in your images in the “Add Photo Here” layer. Same goes with the Logo of the company you’ve worked with or partnered with at the bottom. Just close the sample photos and logo layers after. Though I made this for a specific niche, it doesn’t mean you can’t use this for other sites. Of course you can! Just change the main color or fonts so it will look different from a cooking niche. For the fonts, I only used Poppins that you can download on google fonts because I find it cleaner without any other font combo. Main color used is #f5b151. Seek is a clean, modern and has a gradient feels of media kit made in Photoshop. This is perfect for any kind of blogger’s niche. Everything is customizable and you can tweak it as much as you like. Just like the other two media kit, Seek is has specifications of 8.5×11 inches at 300 ppi. The fonts are a combination of Playfair Display and Poppins – which are available also to download on Google fonts. You can add 4 photos for presentation and add your website’s screen appearance. So there you go. If this reaches a certain good amount of downloads, I will update and add more free media kit in this list. Got questions? You can speak out on the comment section. Also, if you have suggestions, requests and ideas in mind, please do not hesitate to share it here so I can find a way to do that in our future uploads. Enjoy!